The mighty Freya launches off a wave on her way to an overall victory in Class A. Be warned. If you ever get a chance to go out on a photo boat with world-renowned marine photographer Carlo Borlenghi, what he likes best is taking dramatic shots of big boats in big waves—really big waves. It was for this reason that Carlo, our RIB driver, Claudia Tosi, and I spent the better part of a half hour bashing our way out to Pajaros Point at the eastern tip of Virgin Gorda, a chunk of land that is about as mean-looking as they come—with true fangs for rocks reaching out into a maelstrom of breakers. Worse yet, once there we spent another 20 minutes or so just wallowing around, at the same time occasionally bailing out the well of our RIB after the bilge pump apparently decided to give up the ghost. It wasn’t long before I was seriously questioning the wisdom of both our course of action and my own personal decision to join these two obvious fanatics. And then it happened, the reason for all that wallowing. Three of Nautor’s Swan’s finest came plowing through the swells on a beat—the Swan 66 Bounty, followed by two brand-new ClubSwan 50s locked in battle, Cuordileone and the German-flagged Earlybird: the vanguard of the 16 boats taking part in the 2017 Rolex Swan Cup Regatta, on the deep blue waters off the British Virgin Islands. A short while after that it was the Swan 60 Nia’a’s turn—looking resplendent with her royal blue topsides—followed by the Swan 82 Stay Calm. The latter, in particular, put on a show I’ll not soon forget: alternately slicing through the waves and then crashing back down into the troughs, completely engulfing the bow in spray as the foredeck crew worked feverishly to prepare the spinnaker for when it came time to bear away around the razor sharp rocks only a few boatlengths to leeward. Throughout it all, as Carlo directed Claudia to go speeding across Stay Calm’s bow and then come roaring around again so close to leeward I could easily hear the helmsman telling the foredeck crew to “take care,” I couldn’t help thinking that this is what it meant to sail a Swan. Granted, there are countless other great boats out there. But as any sailor of a certain age can tell you, the venerable Finnish boatbuilder Nautor, now Nautor’s Swan and under the direction of its Italian-born chairman, Leonardo Ferragamo, has been doing this kind of thing for decades, generations even. This is a company that sets trends, as opposed to following them: a company that recognizes there’s a time for light weight, for example, but that there is also a time for good design, and if that requires a little extra displacement then so be it—the latest marketing trends be damned. Not that the latest generation of Swans isn’t fast. After shooting the last of the boats rounding Pajaros Point, we set out in hot pursuit with the aim of catching some more big-wave, leeward-mark action down around Round Rock Passage—but to no avail. Despite Claudia’s best efforts, dodging the worst of the chop, surfing down the swells, doing her utmost to knock out our fillings, it was all we could do to catch up to the venerable 65ft ketch Vahine. As for the rest of the fleet—our efforts were clearly pointless. With their spinnakers up they were just too damn fast. Bottom line, these are not just boats that are made to sail, but boats that are made to truly go to sea. And to see them in action in these kinds of conditions is something to behold. Of course, the other great thing about sailing and racing a Swan is the camaraderie. Being the owner or the member of the crew aboard a well-found Swan also means being a part of kind of secret society, a cult, almost, that understands what it means when a builder takes the science of performance and luxury boatbuilding and transforms it into a high art. And not surprisingly, this aspect of sailing a Swan was also readily apparent after the fleet was back on shore: whether it be in the form of a rum-cocktail mixing contest out on the dock or just paying social calls and exchanging war stories. Not only that, but with the regatta being staged by the Yacht Club Costa Smeralda clubhouse on Virgin Gorda, the fleet was able to enjoy itself against the backdrop of one of the truly great sailing destinations of the world—Gorda Sound, home to the equally famous Bitter End Yacht Club, site of a tony beach party on the penultimate night of the event. 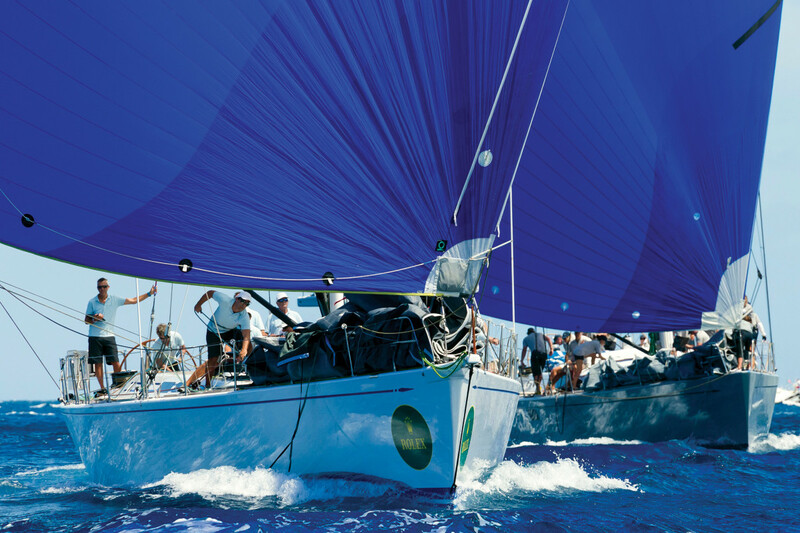 In contrast to the biennial Rolex Swan Cup that the YCCS has been running out of its facility in Port Cervo, Sardinia, since the early 1980s, this was only the third Rolex Swan Cup to be held in the British Virgin Islands. 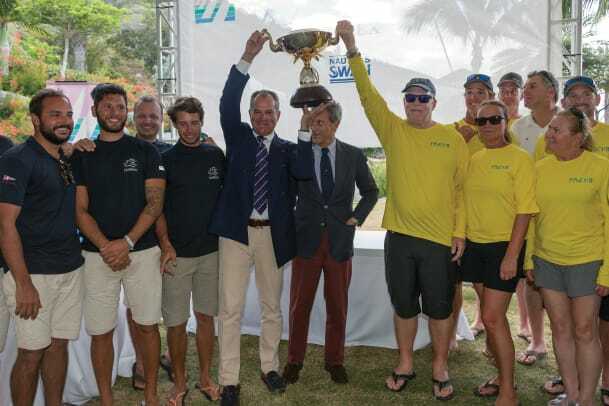 However, if the smiles on the sailors’ faces after each day’s racing were any indication, expect much more Caribbean Swan Cups in the years to come. Meanwhile, back out on the North Sound and beyond it just wouldn’t stop blowing, so that day after day the fleet continued to enjoy the kinds of conditions most sailors can only dream about—to the point where I fear some of the crews may have even started to become a bit spoiled by it all. When the winds dropped into the mid-teens on Day 3, for example, Earlybird owner Hendrik Brandis, who was kind enough to let me tag along, actually apologized in advance for the fact there would probably not be enough pressure out there to go 20 knots the way they had the afternoon before. A long-time racer and Swan owner, he made no bones about how quickly he had become addicted to the planning performance of his new toy. “That’s okay. Really,” I said, doing my best to put his mind at ease. As it was, we ended up having to make do with winds in the high teens all day, which in turn meant a whole lot of power reaching under A-sail at 15-16 knots. You can imagine my disappointment! Better still, almost from the moment they left the dock, the Earlybird crew jumped right back into full-on match race mode, picking up from where they’d left off the day before with the other ClubSwan 50, Cuordileone, which included no less than Nautor’s Swan’s Ferragamo and North Sails president Ken Read in its afterguard. Back and forth the battle raged as the two boats sped downwind under their spinnakers, slaloming around a series of marks before rounding the Dog Islands and heading toward the finish. Midway through, a tack line gave way shortly after a spinnaker set aboard Cuordileone, and in the resulting confusion, the sail exploded in the middle. Down it came and up went another, but not before Earlybird had extended what had already been a narrow lead to a quarter mile or more—a delta she fought to defend right through until the finish. Alas, it was not quite enough for a win in our class, Class B. Correcting out in first place that day was the superbly sailed Bounty. Nor was Earlybird able to stave off Ferragamo and company on the fourth and final day, so that in the end it was Cuordileone winning the class overall, with Bounty in second and Earlybird in third. Nonetheless, it would be hard to imagine a happier sailor than Hendrik at the awards ceremony. It was the same thing in Class A, where the overall win went to Don Macpherson’s Swan 90 Freya, which included Volvo Race and America’s Cup veteran Kimo Worthington (also with North Sails) on board calling tactics, with the Swan 80s Plis Play and Selene in second and third: smiles all around. And who can really blame them? 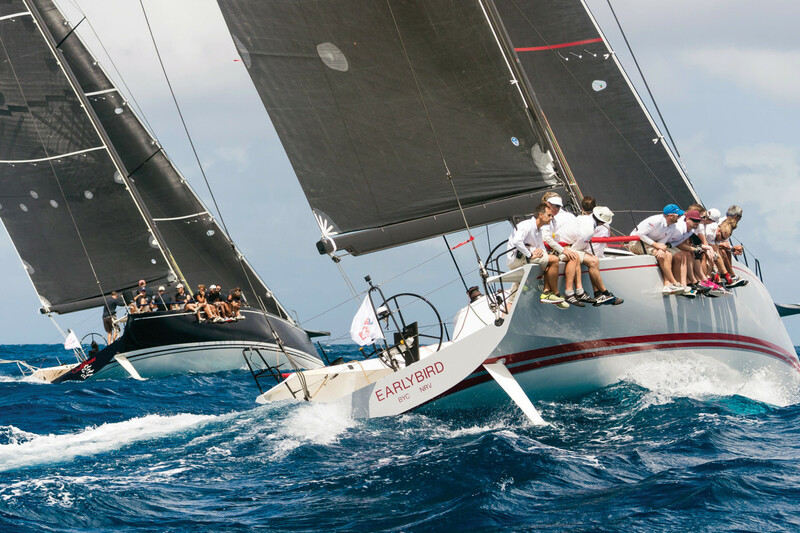 At an event like the Rolex Swan Cup Caribbean, it’s no exaggeration to say everyone is a winner for the simple fact of having been able to get into the mix. 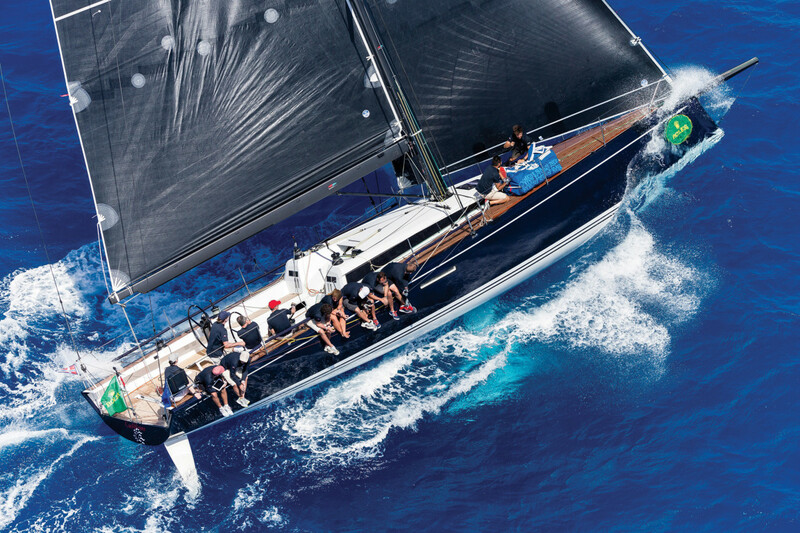 Following in the wakes of the Swan 45 and ClubSwan 42, the ClubSwan 50 represents Nautor’s Swan’s latest foray into the world of one-design racing—and it does so with performance to burn. A product of the Juan Kouyoumdjian design office, the ClubSwan 50 (clubswan50.com) has been positioned as a kind of user-friendly TP52—a boat that offers the same adrenalin-soaked fun without the expense or complication that comes with a box-rule arms race. Signing on to the ClubSwan 50 program also includes being able to compete in such regattas as the Rolex Swan cups in both the Caribbean and the Med, and this fall’s inaugural Nations Trophy—a dedicated one-design event featuring the Swan 45 and ClubSwan 42 as well as the ClubSwan 50 designed to revitalize “the concept of competition between nations” amid the splendor of the Real Club Náutico de Palma (thenationstrophy.com). As for the boat itself, the design is smart and sharp as hell, with an aggressive tumblehome bow and an equally aggressive reverse sheer that screams out for attention both on the water and at the dock. Like the latest generation of TP52s and Volvo racers, the ClubSwan is designed to sail at a substantial angle of heel with an eye toward reducing wetting surface area. Similarly, full sections forward combined with a beamy transom serve to promote planning performance, while the aforementioned reverse sheer serves to reduce windage when the boat is sailing on its ear. A high-aspect steel fin with a lead bulb and twin rudders help tame the boat’s powerful rig, and the hull and spars are all carbon. As evidence of the builder’s commitment to weight reduction, there is also a liberal sprinkling of Ronstan Constrictor rope clutches (think Chinese finger cuffs; the design won a SAIL Pittman Innovation award a number of years ago. 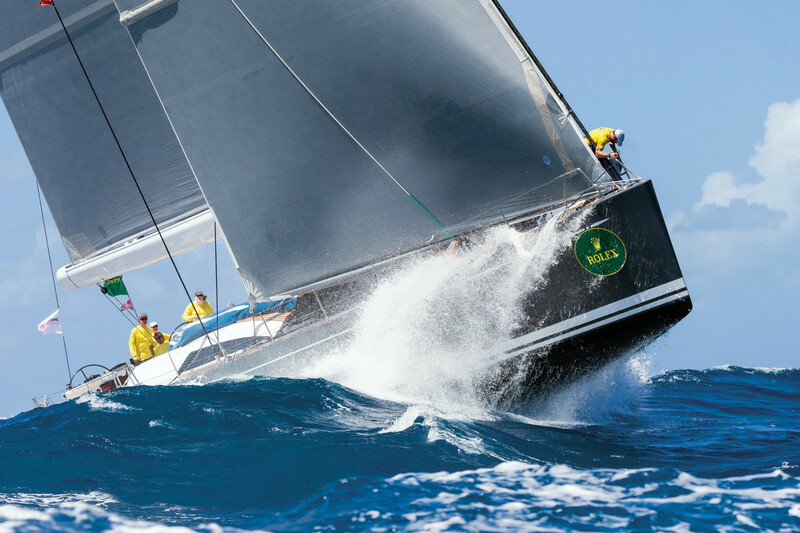 Ed Note: For complete results and additional information on his year’s Rolex Swan Cup Caribbean, visit yccs.it.